There are basic rules of a certain baking. Many people bake a brownie as they bake a cake. It is only two very different baking with a completely different result, so the preparation can never be the same. I give you a few simple tips with which you can make the most delicious brownies from now on. You want a compact, creamy brownie, otherwise you would make a chocolate cake. The secret for such a brownie is that the batter may not be too light. Mixing at a low setting until the ingredients are mixed is more than sufficient. This can be done with a mixer, but with a spatula is also fine. Baked Comfort Food will be useful for getting more tips about Cake, Muffins, Pie etc. If your batter is airy, then the brownie rises too much in the oven. You get a lighter result, but one that collapses after baking. That also means a top that tears through collapsing and edges that still stay up. Not beautiful, nor the most delicious. 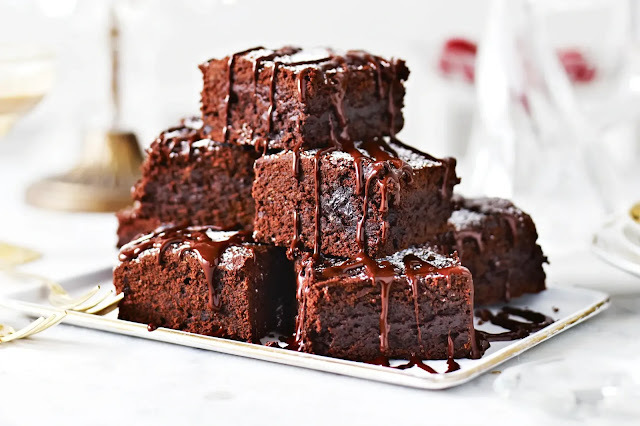 Lovers of brownies are divided into two camps: on the one hand, those who prefer a brownie cake, but on the other hand those who like to have it smudgy and fudge. My ultimate brownie has both characteristics: crispy from the outside, smooth inside and with an intense chocolate and full hazelnut taste. Believe me! Once you've made these brownies you do not want any more, these are the perfect brownies! Bake also a variation on these brownies, for example those with raspberries and cheesecake or brownies with candy bars in it! Preheat the oven to 175 ° C. Line a baking sheet with baking paper. Spread the hazelnuts over the baking sheet and roast golden brown in 7 to 9 minutes. Crush the roasted nuts by placing them on a chopping board and firmly pressing them with the bottom of a pan. The taste of coarsely crushed hazelnuts is the best, so make sure they do not get too fine. Grease a square baking tin of 20 centimeters and cover the bottom and two sides of the baking tin with a piece of parchment cut to size. Put the butter with the chocolate in a heat-resistant bowl and melt it. Allow the melted mixture to cool slightly. In the meantime, whisk the two eggs and the egg yolk with the sugar, salt and vanilla extract until the mixture has become very light in colour and runs like a ribbon from the whisk (about 5 minutes with the mixer). Mix the chocolate mixture carefully with a spatula through the airy eggs until it is a smooth whole. Then mix in the flour and the cocoa powder and finally the pieces of hazelnut. Pour the batter into the baking tin and fry the brownies for 40 minutes. Then let them cool completely in the form before you take them out and cut them into pieces. You can make the brownies a day (or a few days) in advance, they just make it even better. The brownies are also very good to freeze!